This looks for the document’s body and appends a <script> element to it with a src we’ve defined, in this case, “http://foo.bar/baz.js". Keep in mind that if the user is on an empty tab or a place which, for some reason, has no body, nothing will happen as nothing can be appended to. You can host that .JS file wherever is convenient, but keep bandwidth in mind if you expect a ton of traffic. Since many of you may be familiar with the jQuery framework, we’ll use that to build our bookmarklet. That starts by defining v, the minimum version of jQuery that our code can safely use. Using that, it then checks to see if jQuery needs to be loaded. If so, it adds it to the page with cross-browser event handling support to run initMyBookmarklet when jQuery’s ready. If not, it jumps straight to initMyBookmarklet, which adds the myBookmarklet to the global window object. Depending on what kind of bookmarklet you’re making, it may be worthwhile to grab information from the current page. The two most important things are document.location, which returns the page’s URL, and document.title, which returns the page’s title. In that example, we also encoded the spaces into %20, which may be beneficial for older browsers or to make sure the link doesn’t fall apart in transit somewhere. Just for fun, let’s make a little bookmarklet that checks to see if there’s a selected word on the page, and, if there is, searches Wikipedia and shows the results in a jQuery-animated iFrame. After checking to make sure we received an actual value for “s”, we’ll append the new content to the document’s body. In it will be: a container div (“wikiframe”), a background veil (“wikiframe_veil”) and a “Loading…” paragraph, the iFrame itself, and some CSS to make things look pretty and affix everything above the actual page. We set the iFrame’s src attribute to Wikipedia’s search URL plus “s”. Its CSS sets it to display: none; by default, so we can have it make a grander entrance when its page is loaded via its onload attribute and a jQuery animation. After all that’s added to the page, we’ll fade in the background veil. Notice the backslashes at the end of each line of appended HTML. These allow for multiple rows and make everything easier on the eyes for editing. Almost done, but we need to make sure these elements don’t already exist before appending them. We can accomplish that by throwing the above code inside a ($(“#wikiframe”).length == 0) conditional statement, accompanied by some code to remove it all if the statement returns negative. 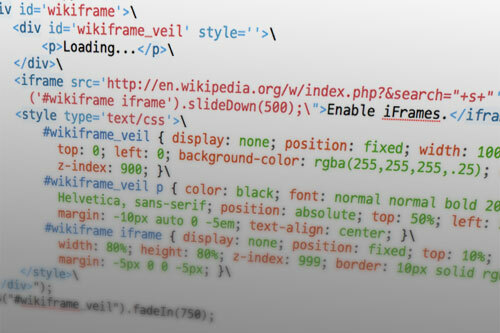 Note that we fade out and remove the “wikiframe” content both if the user re-clicks the bookmarklet after it’s loaded and if the user clicks on its background veil. See that (window.myBookmarklet!==undefined) conditional? That makes sure the .JS file is only appended once and jumps straight to running the myBookmarklet() function if it already exists. This example was fun, but it definitely could be better. While the bookmarklet technically works in IE6, its use of static positioning means that it just kind of appends itself to the bottom of the page. Not very user-friendly! With some more time and attention to rendering differences in IE, the bookmarklet could be made to function and look the same (or at least comparable) in different browsers. Speaking of CSS, remember that any content you add to a page will be affected by that page’s CSS. So, applying a reset to your elements to override any potentially inherited margins, paddings or font stylings would be wise. Develop a coding style and stick to it. Keep it consistent, and keep it neat. Take it easy on the browser. Don’t run processes that you don’t need, and don’t create unnecessary global variables. Use comments where appropriate. They make jumping back into the code later on much easier. Bookmarklet Builder Made way back in 2004, but still useful. Run jQuery Code Bookmarklet A pretty cool script that checks for and loads jQuery all within the bookmarklet. Also has a handy generator. Google AJAX Libraries API Do you prefer Prototype or MooTools to jQuery? Load your preference straight from Google and save yourself the bandwidth. Clean CSS CSS formatter and optimizer, based on csstidy, with a nice GUI and plenty of options. 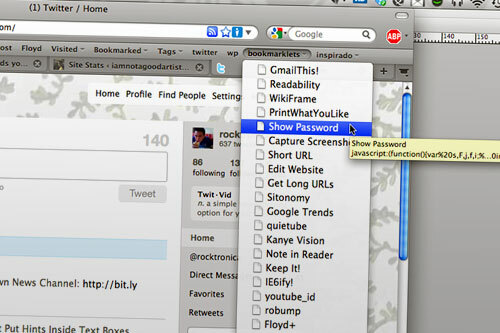 Bookmarklets, Favelets and Snippets Via Smashing Magazine.